monumental structure embodying one or more arched passages, frequently built to span a road and designed to honor a king or general or to commemorate a military triumph. A basic architectural structure built over an opening, made up of wedge-shaped blocks, keeping one another in position, and transferring the vertical pressure of the superimposed load into components transmitted laterally to the adjoining abutments. The first or last of a series of arches located next to an abutment. A sharply pointed two-centered arch, whose centers of curvature are farther apart than the opening. An arch that occurs where a vault intersects a wall. An arch that supports an inner wall where the outer wall is supported in a different manner, such as a brick arch behind a stone lintel. An arch that is formed by a curved solid plate or slab, as contrasted with one formed with individual members or curved ribs. A flattened arch designed by joining a quarter circle to each end of a false ellipse; a three-centered arch with a crown whose radius is greater than the outer pair of curves. A round arch resting on two large corbels with curved profiles. An arch within a wall that contains a recessed flat wall rather than framing an opening. Used to enrich an otherwise unrelieved expanse of masonry. An arch rising only to a slight point struck from two centers within the arch. A form of segmental arch in which the center of the arch is omitted and is replaced by a decorative feature usually applied to a wall above the entablature over a door or window. A flat segmental arch with a slightly upward curve in the intrados and sometimes also in the extrados. An arch that takes the form of an inverted catenary, i.e., the curve formed by a flexible cord hung between the two points of support. A five-Iobed pattern divided by cusps; a cusped arch with five foliations worked into the intrados; a cinque-foil tracery at the apex of a window. An arch whose intrados takes the form of a segment of a circle. in architecture, a curved, structural member spanning an opening in a wall or a space between two supports—piers, columns, pylons, and the like. Depending on the size of the opening, the stress, and the purpose served, the arches are made of stone, reinforced concrete, metal, or wood. Depending on the shape of the curve, arches are distinguished as semiround or semicircular (the most widespread type), lancet (characteristic of Gothic architecture), horseshoe (common in the architecture of the Arabic countries), ogee, multifoil, rampant (with supports of different heights), and so on. Arches (stone) first appeared in the architecture of the ancient East, where there was no wood suited to the construction of large horizontal beamed ceilings. Later, arches were widely used in the architecture of ancient Rome (in buildings, aqueducts, and triumphal arches). Modified in keeping with the system used to construct vaulted ceilings and the demands of style, arches have continued to be an important architectural element. Triumphal arches, either standing alone or as a part of a building (as the arches in the General Headquarters Building in Leningrad), sometimes determine the character of an ensemble. In modern construction, arches are used as the supporting elements of roofs, bridge spans, viaducts, and the like. Under the load the arch works mainly on the pressure principle and, in distinction to beams and girders, transmits not only the weight (vertical load) but also the pressure (horizontal thrust) which is resisted by the support, the tie beam, and the counterfort. In structural diagrams arches appear as hingeless, two-hinged, and three-hinged. The stability of the supports in hingeless arches is ensured by hard fixing in the structures supporting the arch. In planning the arch, the outline of its axis is so designed that the permanent load (the arch’s own weight and the weight of the ceiling, roofing, and other elements supported by it) are converted into compressive stress, thereby assuring the smallest size of its cross section. Lattice arches, usually made of wood or metal, are called trussed arches. Spravochnik proektirovshchika promyshlennykh, zhilykh i obshchestvennykh zdanii i sooruzhenii: Raschetno-teoreticheskii. Edited by A. A. Umanskii. Moscow, 1960. Goethals, E. Arcs, voûtes, coupoles, vols. 1–2. Brussels, 1946–48. A structure curved and so designed that when it is subjected to vertical loads, its two end supports exert reaction forces with inwardly directed horizontal components; common uses for the arch are as a bridge, support for a roadway or railroad track, or part of a building. A structure, usually curved, that when subjected to vertical loads causes its two end supports to develop reactions with inwardly directed horizontal components. 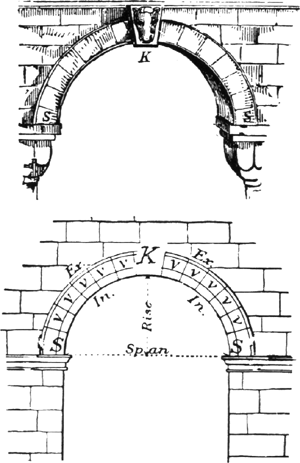 The designations of the various parts of an arch are given in the illustration. The commonest uses for an arch are as a bridge, supporting a roadway, railroad track, or footpath, and as part of a building, where it provides a large open space unobstructed by columns. Arches are usually built of steel, reinforced concrete, or timber. On the basis of structural behavior, arches are classified as fixed (hingeless), single-hinged, two-hinged, or three-hinged. An arch is considered to be fixed when rotation is prevented at its supports. Reinforced concrete ribs are almost always fixed. For long-span steel structures only fixed solid-rib arches are used. Because of its greater stiffness, the fixed arch is better suited for long spans than hinged arches. Concrete is relatively weak in tension and shear but strong in compression and is therefore ideal for arch construction. Precast reinforced concrete arches of the three-hinged type have been used in buildings for spans up to 160 ft (49 m). Steel arches are solid-rib or braced-rib arches. Solid-rib arches usually have two hinges but may be hingeless. The braced-rib arch has a system of diagonal bracing replacing the solid web of the solid-rib arch. The world's longest arch spans are two-hinged arches of the braced-rib type. 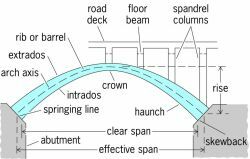 The spandrel-braced arch is essentially a deck truss with a curved lower chord, the truss being capable of developing horizontal thrust at each support. This type of arch is generally constructed with two or three hinges because of the difficulty of adequately anchoring the skewbacks. The masonry arch can provide structure and beauty, is fireproof, requires comparatively little maintenance, and has a high tolerance for foundation settlement and movement due to other environmental factors. Most arches are curved, but many hectares (acres) of floor in highrise office and public buildings are supported by hollow-tile jack (flat) arches. If a curved arch is wide (dimension normal to span), the arch is referred to as a barrel arch or vault. The vault cross section may have several different shapes. Contiguous vaults may be individual, may intersect, or may cross. A four-part vault is termed quadripartite. Contiguous quadripartite vaults that are supported at the corners by columns are masonry skeletons of large cathedrals. On drawings, abbr. for architect, architecture, or architectural. (ARCHitecture) The CPU that a Linux distribution runs on. An AltArch (alternative arch) refers to an optional CPU for a particular version. See Linux distribution.